ROGER DUBUIS was founded in 1995 and, since then, has been injecting its DNA with resolutely new and bold genetic codes. Positioned on the cusp of haute horlogerie and adhering to its exacting and exclusive criteria, the brand established its head office in 2001 in Meyrin / Geneva, where two buildings housing ultra-modern industrial equipment were constructed for the Manufacture. In scarcely eleven years, the Manufacture has created its 28 complicated, often highly complicated, movements. While their technical characteristics require the most traditional horological savoir-faire, the production and manufacturing rely on cutting-edge expertise.All ROGER DUBUIS movements bear the ‘Poinçon de Genève’ and, since 2003, have been equipped with the Manufacture’s own balance-spring, positioning the brand’s products at the very apex of prestige haute horlogerie in Switzerland. Since 1996, ROGER DUBUIS creates watch collections each line has a powerful personality and a unique identity. An exuberant and original jewellery line was added to its portfolio in 2004. In search of a new lease of life, the ROGER DUBUIS Manufacture joined Richemont (one of the world's leading luxury goods groups) in 2008, becoming the ninth watch manufactory to join this very exclusive group. This is an extraordinarily favourable union for the ‘enfant terrible’ of Geneva’s exclusive watchmakers as it will benefit from all the advantages that come from being a member of Richemont. Ø How the Economic crisis affects the Luxury sector? The last 18 months or so has been a challenging period. The global economic crisis, which stemmed from the over-expansion of credit, saw consumer confidence in most markets collapse in late 2008 after a boom period up to September of that year. The crisis has structurally changed the market. The market is more concentrated: larger brands gaining market share and clients are paying more attention to detail. The crisis has as consequence deep changes in consumer behavior as we experienced with our clients: they focus more on quality, they are looking for experiencing the brand (service), they want understated luxury items and they purchase more carefully. 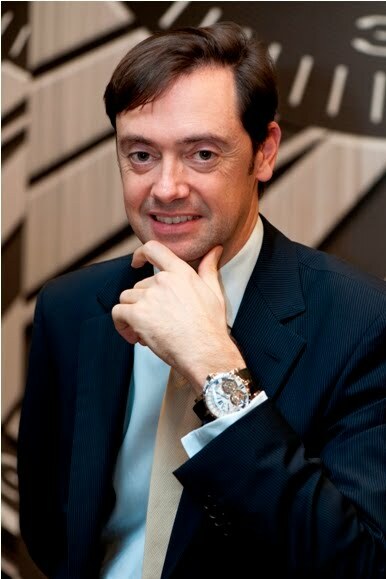 Ø What’s the plan for ROGER DUBUIS in UAE, Saudi, Qatar, Kuwait, Bahrain, Oman and Lebanon? For the next years, we are planning to focus our attention on our distribution. We want to have a very exclusive distribution network in this region with the best possible partners, the best stores and the best visibility. We have started already opening Corners in the Gulf region, and by the end of the year, one third of our distribution network will be in the form of Corners or Shop-in-shops. We will keep expanding in the near future. Ø Can you tell us the size of the Luxury watches in the Middle East ? Market share for UAE % or USD? As per the “Federation Suisse de l'horlogerie” report, for the first 7 months of the year (Jan-July), 2010 is 20.6% above 2009, and 8.4% below the same period in 2008, in Value. What is interesting to notice though, is that when we take a close look at the Unit Wholesale Value, the Middle East Average is 9.38% higher than the global average. The gap was only 5.22% in 2009, while at its peak - just before the recession - the gap was 16.27%. Basically, this indicates that the effects of the recession are still here; however, their impact is fading away slowly, but surely. We believe that next SIHH will allow us to confirm this positive trend. As for the UAE, it has ranked for the same period as the 10th importer of Swiss watches with a total of USD 312 Million (316.9 Million Swiss Francs). This is approximately 3.63% Market share in comparison with the rest of the world. Greater China (Hong Kong & Mainland China) takes the lead with a total of USD 2.22 Billion (2.25 Billion Swiss Francs) worth of Swiss watches imported in the country, accounting for 25.75% of the Swiss Exports. The impressive thing, is that the import per Capita in the UAE, is amongst the highest in the world after Hong Kong and Singapore. Ø How many boutiques ROGER DUBUIS have around the world? How many you are planning to open? ROGER DUBUIS has 170 points of sales worldwide and has currently six Boutiques: Geneva, Shanghai, Hong-Kong (2), Kuala Lumpur and Singapore. Soon, Kiev, Bangkok and Moscow will be opened. Ø What is the special markets in the region? Each region and each market has its own specificities, its own taste and its own challenges. The Gulf region, as a whole, is quite special. We have noticed that the customer in the region is quite well aware of the latest novelties and latest trends. Accordingly, the Gulf customer likes to see a novelty reaching the market first. This was one of the main reasons why we had our latest watch - the EasyDiver - launched in Dubai before anywhere else in the world. Ø The size of the Luxury market in the Middle East? “Luxury market” is a wide term…! Ø How does the crisis affected the watch industry? As said previously, the crisis has structurally changed the market, including for the watchmaking industry: lots of small companies disappeared and largest companies had to revise their global strategy in terms of products, communication and distribution. ROGER DUBUIS has taken advantage of this difficult but challenging period to optimise its operations and transform them into opportunities. The crisis has intensified competition and the companies had to adapt their offer to the market to ensure its viability. Brands had to create more awareness by educating consumers about product quality and brand heritage: customers pay more attention to the content (movement) of the watch than before and are looking for sustainable brands. In addition to that, companies must differentiate themselves. Last but not least, brands also had to focus on customer relationship management to personalize one-to-one contacts and services. Ø What does ROGER DUBUIS is offering this year as new models? ROGER DUBUIS will unveil its new watch collection at the 2011 SIHH (17-21 January). Until then, we keep it secret; I can only tell you that we will be presenting a new watch collection for men, one for ladies as well as new chronograph movement. New models will be exposed, including some declinations of dials of models recently presented. Ø Do you think the Luxury sector will continue to grow? By what percentage? The luxury market and the watch industry will keep growing if companies keep in mind that customers behaviour have changed in their way of purchasing: watch brands must keep developing their creativity while offering watch with a “true content”. Clients are looking for quality associated to creativity with a true value for money ratio. Ø When did the Luxury industry started globally? Luxury has a long history: let’s refer to the famed Silk Road that started in China in the second century BC! Regarding the hard luxury industry, I would say that it has been strongly developed after the second world war and by then, the industry has developed more more exceptional and extravagant products!